Editor’s note: This is part three of a series on “Best Practices for Time-management.” You can see part one and two here.  In 1955, The Economist published an article titled “Parkinson’s Law.” Cyril Parkinson was a British naval historian and author of more than 60 books. The most famous of these works was his bestseller Parkinson’s Law, a book based on his painstaking research of over 1000 years of British Naval operational data. This work established Parkinson as an important scholar in public administration and management, and Parkinson’s Law is still considered ground-breaking, even 60 years later. But what is Parkinson’s Law? PARKINSON’S LAW: WORK EXPANDS TO FIT THE TIME AVAILABLE FOR ITS COMPLETION. This certainly lines up with my experience and the experience of clients I work with: we don’t need to find work; work always finds us. 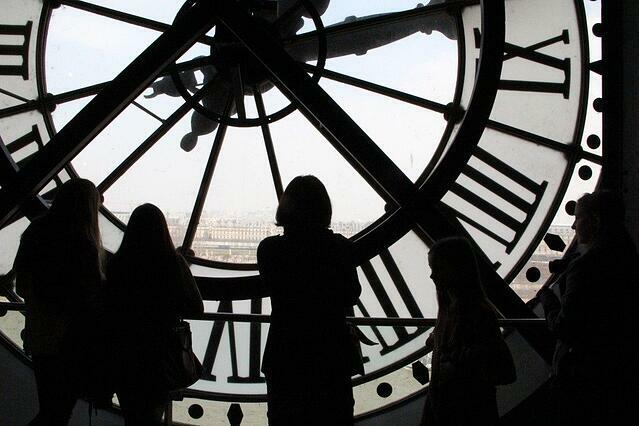 I spent 30 years in fast-paced, high-stress jobs and there was always more work than time. So mastering time-management skills was not only a key to my success, but it was a key to my mental health and to having a life outside of work. With Parkinson’s Law in mind, I want to offer a collection of ideas, tools and techniques to help us all get more from our time, leading to a more fulfilling 2016 in all areas of our lives. These are practices I use in my own work and ones I’ve seen benefit my clients time and again. We looked at numbers 1 through 4 in previous articles. Today, I will cover best practices 5 and 6. 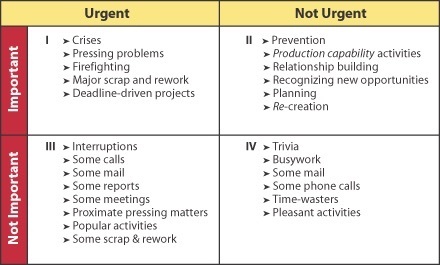 Time-Management Practice 5: Learn a prioritization matrix for that “To Do” system. The To Do systems I discussed in my last installment are the easy part, now comes the real work. Don’t get me wrong, there really are some fires that need to be put out right away. If you wonder if you suffer, take the full Urgency Index Questionnaire by Stephen Covey and self-assess where you are. So, let’s get a handle on that To Do list and stop the urgency cycle. 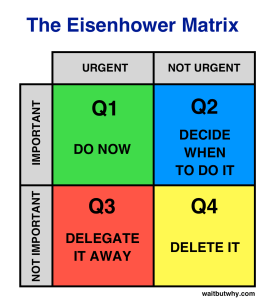 Two tools I use to classify, categorize and prioritize my To Do’s are The Stephen Covey Time Management Matrix and the Eisenhower matrix (developed by General and later President Eisenhower). (Source: 1994 Steven Covey Leadership Center cited in First Things First). Step one is to put your To Do’s in the format of Covey’s matrix. Step two is Eisenhower’s matrix. Now, I’ll say that you might not be able to apply Eisenhower’s matrix as ruthlessly as shown here, but you hopefully get the general idea. Q1 should be done now. Q2 should be scheduled and then completed at that time. Q3 should be moved off your plate as quickly as possible. If that’s through delegation or some sort of technological solution (like an auto-responder to some emails), then so be it. Q4 is what your breaks or lunch or off-hours are for. They might be legitimate uses of your time — but not for the purpose of growing your work. Put some time into analyzing and executing these matrices and you’ll find you will be getting more important and meaningful things done. Time-Management Practice 6: Have the courage to say “no” to meetings, assignments and interruptions. We have taught ourselves to say no to our children, telemarketers and politicians, so why can’t we learn so say no, when appropriate, in a professional context? The struggle is that “no” is sometimes considered a four letter word in business. Research studies have shown that people will often say yes to a request simply because saying no makes them even more uncomfortable. Saying yes to everything you are asked to do is viewed as a way to show you are “a company man/woman,” a team player and will make you stand out. I know how strong this desire can be; I used to be known as a “yes man.” The paradoxical thing was that the people that had the courage to calculate their time and say no when appropriate were just as successful as I was and I did not bump into to them in the office on the weekends. Even more amazing - I think they did higher quality work than I did. Carefully assess the request before committing. What this means is that you may have to ask someone for a little time to consider their request before committing one way or the other. Recognize your emotions, but don’t make an emotional response if possible. If the person you’re saying no to believes that your no is primarily an emotional response, it will likely not be taken seriously. Say your “no” in person or on the phone whenever possible (not email, voicemail or text). Being misunderstood by the person you’re saying no to is only going to create friction in the relationship and generate a longer conversation (that will take time you may not have to begin with). They need to hear the tone of your voice, and they need to be able to ask questions in real time in order to feel heard. Hopefully, these will get you started. There is also an excellent article on the topic in the Harvard Business Review: “How to Say No to Taking on More Work” by Rebecca Knight. Let me know if you have any thoughts or questions in the comments section below!